This book is the final collaboration of Joseph M. Forshaw and William T. Cooper and combines the finest Cooper artwork with an updated, authoritative Forshaw text. Presented as a Deluxe Edition, this book is truly a combination of art and science presenting many previously unpublished Cooper drawings, sketches and paintings. Containing more than 300 artworks, it is fully cased in grey Ballantine cloth, with black blocking and marbled endpapers. The book is landscape format printed on fine quality satin art paper and the size is 350 mm x 305 mm. 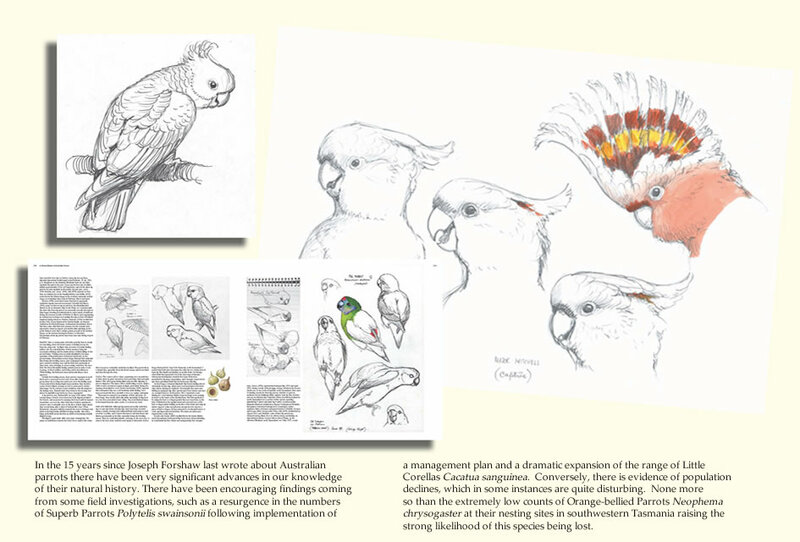 An entirely new approach is adopted with the integration of an updated technical text and an exciting visual record of the beauty, diversity and appeal of Australian parrots. It is a tribute to William (Bill) Cooper, and features numerous previously unpublished field sketches, preliminary drawings and spectacular paintings of parrots in their natural environment. 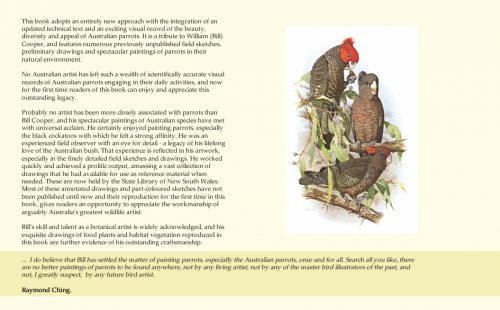 No Australian artist has left such a wealth of scientifically accurate visual records of Australian parrots engaging in their daily activities, and now for the first time readers of this book can enjoy and appreciate this outstanding legacy. In 1997 Nokomis Editions published Turacos: A portfolio of all Species. This was the first part of a two-part project aimed at reproducing William T. Cooper’s work to the highest possible publishing standards. We hoped that viewers seeing the plates could imagine themselves looking at a just-completed painting on the easel in Bill’s studio. Cockatoos: A Portfolio of all Species contains twenty-one plates and concludes this two-part project, showing Bill Cooper’s exquisite watercolours once again in full size. His love for cockatoos is obvious and his mastery deserves this elegant presentation. One of Bill’s many artistic strengths is his careful attention to habitats and bird-plant associations, which is sensitively portrayed in each painting. These wonderful birds of the forests and plains have all been painted in landscape format, allowing him to show more diverse compositions and postures. The accompanying text by Joseph M. Forshaw departs from his usual style and forms an elegant essay interspersed with the plates, along with Bill Cooper’s Artists Notes. 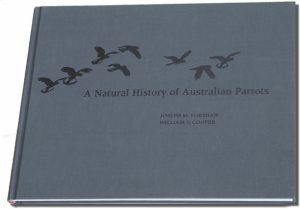 The Introduction is written by Stephen Garnett, a leading researcher on Australia’s endangered cockatoos: “As a connoisseur I should be difficult to satisfy. But satisfied I am – to encounter a Portfolio that so effectively transmits the presence of these splendid birds to its viewers is an enormous pleasure. 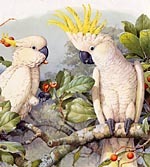 The cockatoos have indeed been fortunate to be the subject of Bill Cooper’s attention at the zenith of his talent, and to have maintained the interest of Joe Forshaw over so many decades”. 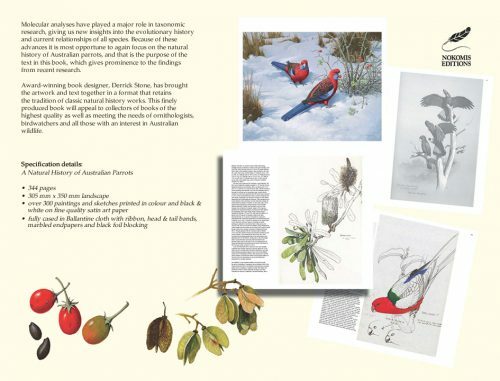 The Nokomis Group is proud to present this landmark book Fruits of the Australian Tropical Rainforest, a publication of botanical and artistic excellence. The first definitive work of this unique African bird family. With publication by Nokomis Editions of Turacos: A Portfolio of All Species the masterful paintings by William Cooper were, for the first time, reproduced at their original size. 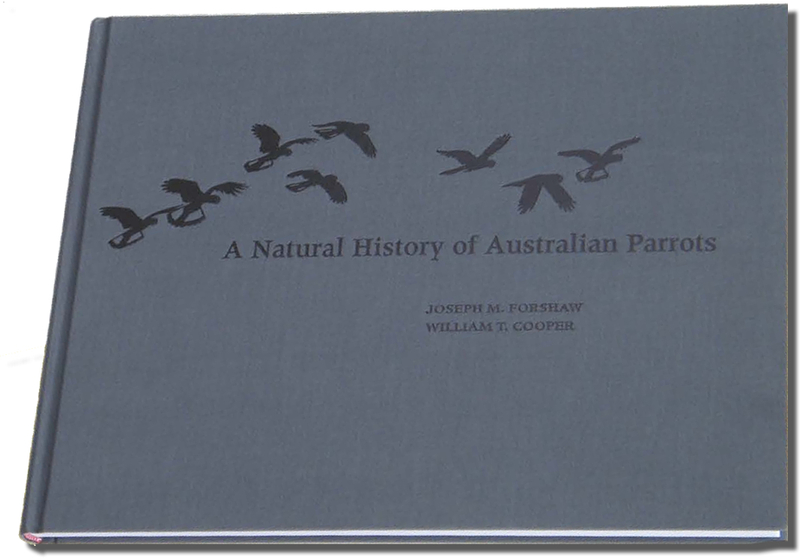 This placed primary focus on the remarkable illustrations of all species in one of the world’s most spectacular bird groups, and the accompanying text by Joseph Forshaw was written to complement the illustrations. Nokomis Editions now proudly announces publication of Turacos: A Natural History of the Musophagidae, in which emphasis is placed on the many fascinating aspects of the natural history of these spectacularly beautiful birds, with three new plates from William Cooper. An extremely important ornithological and avicultural monograph, Turacos: A Natural History of the Musophagidae is a most attractive volume with an easy-to-read text and spectacularly beautiful plates. Maintaining the highest standards of excellence, that have become a hallmark oft he Forshaw-Cooper association, it will be appreciated by ornithologists, aviculturists and lovers of fine bird books.